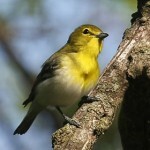 Song is series of short phrases, richer than Red-eyed Vireo’s; given slower, with longer pauses. Description: Sexes similar. 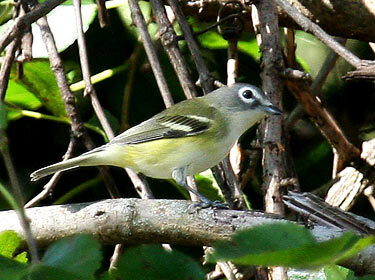 Blue-gray head contrasts with olive back; bold white spectacles; throat and underparts are white; yellow sides; two bold white or yellowish wing bars. Habitat: Found in open coniferous or mixed forests, and in shade trees. Feeds from the canopy to shrubby understory. 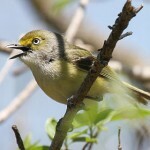 Fun Facts: Blue-headed Vireo’s depend on Hemlock evergreen trees when they arrive on the breeding grounds because the deciduous trees have not leafed out yet. 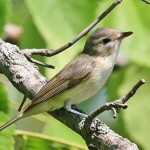 Additional Information: Once lumped together with Cassin’s and Plumbeous Vireo into one species, the Solitary Vireo.